We welcome you to this ‘double bill’ of transport delight based in the north west seaside town of Morecambe on the Lancashire coast. The weekend of the 28th and 29th May 2016 was bathed in sunshine as the independent transport videos cameras attended the Stagecoach Morecambe Depot Open Day on the Saturday and the annual Ribble Running Day on the Sunday. Our filming begins early on Saturday morning at the Globe Arena ‘park & ride’ in Morecambe where we board former Barrow Corporation, Park Royal bodied Leyland PD2/40, 169 (CEO 956) for the ride to the Stagecoach depot. Here we see the exhibits coming and going as well as many parked up for inspection by the public and enthusiasts. We take a look behind the scenes at the workshops. We then ride on Blackpool Corporation 512 (HFR 512E), a Leyland PD3A to Morecambe bus station, returning to the depot on board 210 (CHH 210T), a Leyland National formally owned by Cumberland Motor Services. Our next ride is to Lancaster on board Ribble 1481 (TRN 481V), a Leyland Atlantean AN68A with an ECW H74F body. At Lancaster we observe the contemporary Stagecoach vehicles, made up of Enviro400s, ALX400s and some Alexander bodied Volvo Olympians. In years gone by these would have been Ribble vehicles! 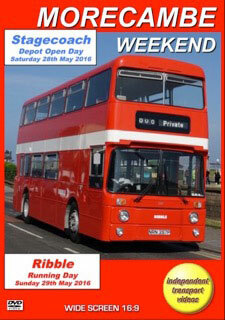 Our cameras return to Morecambe depot on board another former Ribble Atlantean. This time it is 1397 (NRN 397P), an AN68 with Park Royal bodywork. We film more action along Northgate which is the road that runs towards the depot, so here we see both preserved and current Stagecoach vehicles in action! An excellent event – well done to all at Stagecoach for organising this superb day. The Ribble Vehicle Preservation Trust’s Morecambe Running Day is always an event to enjoy. This year was no exception. Our cameras were on the seafront bright and early to see the first vehicles arriving to either take up their positions on display or await service. We record the action at a number of locations including the Winter Gardens, Marine Road, Festival Market and Morecambe Promenade to name but a few. We also take a number of rides, including one on Ribble 1775 (RCK 920), a Leyland PD3 with Metro-Cammell bodywork to Heysham. We return back to Morecambe on former Morecambe Corporation, Park Royal bodied AEC Regent III, 69 (LTF 254) – a most tuneful vehicle! Our next journey out is on board our old friend – Fishwick No. 5 (528 CTF), the low height Leyland PD2 with Weymann bodywork. We travel to Carnforth and back to Morecambe on this beautifully restored vehicle. Final scenes are shot along the Promenade on Morecambe seafront as we see the vehicles heading for home and the buses completing their final duties. Thank you to all involved in producing yet another excellent Ribble Morecambe Running Day. We hope you enjoy this programme as much as we enjoyed filming it!